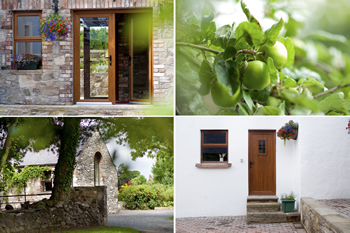 The Old Orchard Self Catering Accommodation is situated in a delightful rural setting, just outside Belfast in Co. Down. From Belfast take the A20 towards Newtownards. At the Elk Inn / Russells Wine Shop take the A22 towards Comber. After 1 mile you will pass through a staggered junction, continue up a slight hill and enter the country. After two bad bends you will see Peartree Hill on the right hand side. Pass through the stone pillars, the entrance to The Old Orchard is through black gates and white pillars on the right hand side 300m up this lane. From Dublin take the M1 Saintfield exit and follow signs for Carryduff/Saintfield. At Carryduff follow all signs for Comber. Just before entering Comber, take A22 to Belfast (turning on left). Follow all signs towards Belfast. After the Billy Neill School of Excellance (football pitches on right) take the turning on the left marked Peartree Hill. Follow as above.